1. Their fur just isn’t enough – Dog have similar needs to humans. Would you be warm enough in just a coat? If you’re cold they’re cold. Even dogs bred with thick and double coats still get cold. Dogs with short coats, puppies and older dogs need even more protection in cold temps. Consider a doggie jacket when going outside. Hypothermia and frostbite can come on quickly. Signs of hypothermia are: shivering, shallow breathing, weak pulse or lethargy. Frostbite most commonly occurs on their ears, tails, scrotum and feet. Some indications of frostbite are: discolored skin (red, pale, or grayish) swelling, or blisters. 2. Proper shelter – If it is not possible to bring your dog inside or if they will be outside for extended periods it is imperative that they have proper shelter! A proper shelter is just big enough for them to stand up and turn around. It must be well insulated, and have good bedding. Straw and blankets are best. Consider putting up a wind break if they are in a kennel or fenced area by using tarps. 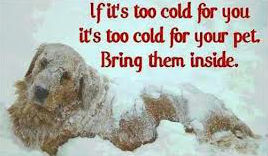 If you keep your dog and especially your cat in the garage in the winter make sure you check before you start your car. A warm engine is very inviting to them. We all know what that means. 3. Food and water – Dogs need more food during the winter months. They need the added calories to generate body heat. Depending on the dog the extra food can be as much as 30%. Make sure you check the water bowl often. Dogs cannot eat snow to provide water. If you can’t change the water often consider a heated water bowl. 4. Keep an eye on their paws – When you walk your dog in winter be aware of their paws. Chemicals like salt, magnesium, or calcium chloride used to remove ice from sidewalks can cause irritation to paws and can be toxic if ingested. Antifreeze has the same effect. Snow and ice can stick to the fur around their paws and cause lack of blood flow, cracking and frostbite. Check the paws when you get home and clean them. Trimming the fur around the paws helps or you can buy some doggie boots. If the paws get cracked or raw use a animal specific balm on them. 5. Winter wellness – Make sure your dog has had their wellness exam. Cold weather is harder on your body so it is logical that it would be “ruffer” on your dog too. The cold can irritate or worsen some conditions like arthritis. Go see your vet and make sure your fur buddy is go to go for winter. 6. Grooming – A properly groomed dog is something that is often overlooked in the winter. A longer coat is not necessarily the best thing for them. A well groomed coat is much better insulation than a matted out of control coat. 7. Keep them on a leash – More dogs are lost in the winter than any other season. Along with the leash make sure your dog has been micro-chipped and has an I.D. tag with your information on it. 8. Watch that heat source – Keep an eye on supplemental heat sources. Indoors, a fireplace is a great heat source but can easily cause severe burns on you and your dog. Make sure you have a screen for your fireplace and protection in front of other heaters. Outdoors, a supplemental heater can be a fire hazard. 9. Towel off when coming back inside – If you go for a walk and it is snowing or raining be sure to dry off your buddy when you come back inside. This also gives you a chance to check the paws and for signs of frostbite. 10. Never leave them in the car – Just like the heat in summer the cold in winter can be deadly for your dog. The temperature drops quickly in a car during the winter just like it heats up rapidly in summer. DO NOT LEAVE YOUR DOG IN THE CAR! And finally. Here are some winter exercise tips from Ceasar Milan.